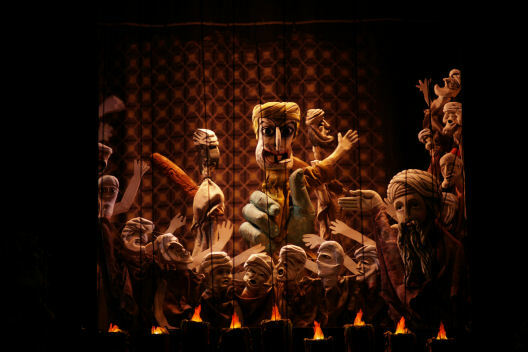 A Puppet Opera. How could i pass this post opportunity up? You think such a thing would be by some daring new theater company, at the very least a contemporary work, since the, say, 90s, but no. Mater Peter’s Puppet Show is from 1923, written by the Spanish composer Manueal de Falla. The opera is a mini-one, running only 27 minutes. It is taken from Don Quixote. In the book, Don Quixote and Sancho witness a puppet show by Master Peter the puppeteer. The opera is that puppet show. This particular performance is done by Madcap Puppets. Welcome to the weirdest, creepiest marionette video you will see all day. For most of you who don’t seek this stuff out (what DO you do with your days?) this will probably be the top creepy marionette thing of your week, even your month. “Hilum is a micro comic-tragedy based on the cycles of the washing machine. A mixed batch of nursery rhymes, cartoon images, partial objects and other references to childhood locution are thrown into the spin cycle with the aim of airing the fairy tale’s dirty laundry. They are currently at work on a puppet opera. I would love to do a puppet opera. If you ever want to do one, email me. It would be criminal of me to bring up the Quay Brothers and not Jan Svankmajer. Jan Svankmajer is a Czech film maker, born in 1934 who is also internationally reknowned for his stop motion films. 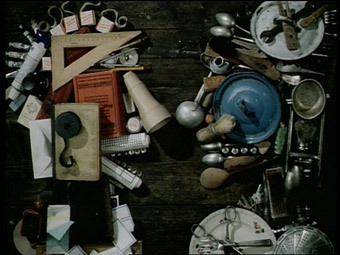 Many people assume he was a major inspiration on the Quay Brothers, and indeed the stylistic similarities are plentiful at first glance, but despite that the Quays did a short film homage to Svankmajer titled The Cabinet of Jan Svankmajer , the truth is that they discovered him rather late, after most of their style had already been formulated. Kindred spirits are all they are. Svankmajer is from Prague which has a long history of puppet theater which was an enormous influence on him. He studied at the College of Applied Arts in Prague and later in the Department of Puppetry at the Prague Academy of Performing Arts. He worked with Semafore Theater and Laterna Magika, two famous Czech visionary theaters before beginning his film career in 1964. A few years later Svankmajer embraced surrealism heart and soul and thus began the film work that has made him famous. He made his first surrealistly influenced film The Garden in 1968, joined the Czechoslovakian Surrealist Group and married Eva Švankmajerová, an internationally known surrealist painter, ceramicist, and writer. Svankmajer and Svankmajerova (in Czech culture when a woman marries she takes her husband’s last name plus the postfix –ova) collaborated on several of his movies, including Alice, Faust, and Otesánek. Today we will focus on Alice. I don’t think it takes much guesswork to figure out it’s a take on Alice in Wonderland, but with more scissors and creepy dolls. 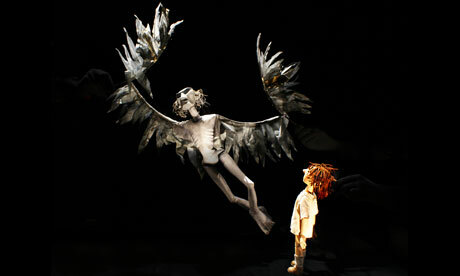 As long as we’re here we might as well show a bit from Faust, which shows Svankmajer’s puppet, theater and surrealist influences all at once, while being a bit more linear. Lastly, i cannot recommend highly enough his film Little Otik from 2000. It’s a story, not an experiment in surrealism, so if you really just prefer stories you needn’t worry. The story centers around the modern telling of an old Czech folktale about a couple who raises a log like a child. 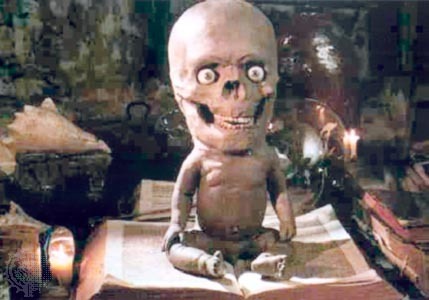 It’s mostly live action with some of Svankmajer’s stop motion worked with extraordinarily appropriateness. You just have to trust me, it is REALLY, REALLY awesome, and totally worth seeing. Little Otik. Little Otik. Just go watch it. We cannot discuss creepy puppets and dolls without discussing the modern masters of creepy dolls: The Brother Quay and Jan Svankmajer. We shall touch upon the great Jan Svankmajer at a later date, perhaps even tomorrow. For today let us look at the genius of the the Brothers Quay. I know countless film makers who list them as a major inspiration. They’re two brother from Pennsylvania who do stop motion animation. Very… creepy stop motion animation, inspired by a Polish film makers Walerian Borowczyk and Jan Lenica whose most well known work was in the 50s through the 70s. Stephen and Timothy Quay are twins, born in 1947 in Norristown, Pennsylvania. During their 20s, beginning in 1969, they lived and studied in England and the Netherlands and finally in 1979 settled in South London, hooked up with Keith Griffiths, who would go on to produce all of their films, and got down to their bizarre and unorthodox film career. This is one of their more well known examples. Like i said, creepy dolls? They’ve got the trademark on creepy dolls. Their films almost never have spoken dialogue. Well, no meaningful spoken dialogue. Weird, grating, high pitched noises don’t exactly count as dialogue. Their influence is astounding. They have dominated film festivals and avante garde film circuits. They’ve even done theatrical set design. In 1998 their Tony-nominated set designs for The Chairs was well lauded on Broadway.They’re still quite active and have even done a number of music videos. They don’t have a website or i would send you there, but a good resource page is here. I leave you now with a personal favorite of mine. The design for this is just gorgeous. It’s a delight to view, although, you know, in a delightful creepy way. The Quay Brothers: The Comb. Before we get underway let me give updates as they’re happening. After careful consideration there WILL be a KIckstarter/Indiegogo campaign. We want and need this to be the best possible production we can manage. We want and need the people involved to be paid. I myself will not make a dime off of this and indeed, at the end of the day this performance cannot, even by miracle, turn a profit. This is long term investment so to speak. My payday will come down the road. But the space must be paid for (as always) whatever is on stage must be procured and the personnel must be paid. We’re working on a grant and filling the seats for the performances will actually not be a problem at all. But still we will need more money to ensure everyone involved is paid and all expenses met, so when the time to begin the campaign draws close you will hear about it. We’ll talk then. Oh, and you bet your sweet behind after the performance happens we’ll be posting extensive videos of it. But for today, let’s look at stage puppetry! The Director Mark Swetz has a number of interesting ideas, a few of which can only be pulled off down the road but one of the cooler ones we can and will do this performance is use puppets to be the Dolls, especially Jasper THE Doll character. Stage puppetry has been going strong for awhile now. The following videos illustrate different examples. How WE go about it will depend on the puppeteer we find to design and implement the Doll concept. These videos are not intended to show what OUR Doll will look like, just some cool examples of puppetry on stage. 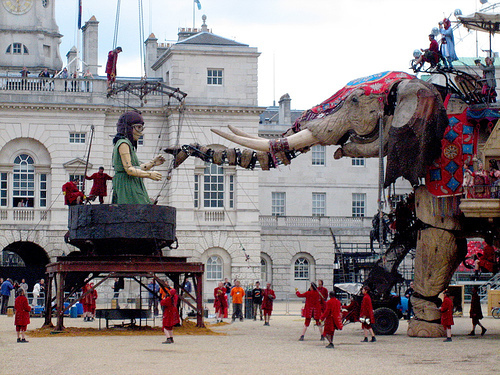 The Sultan’s Elephant is a show, specifically a piece of marionette street theater featuring a giant mechanical elephant. 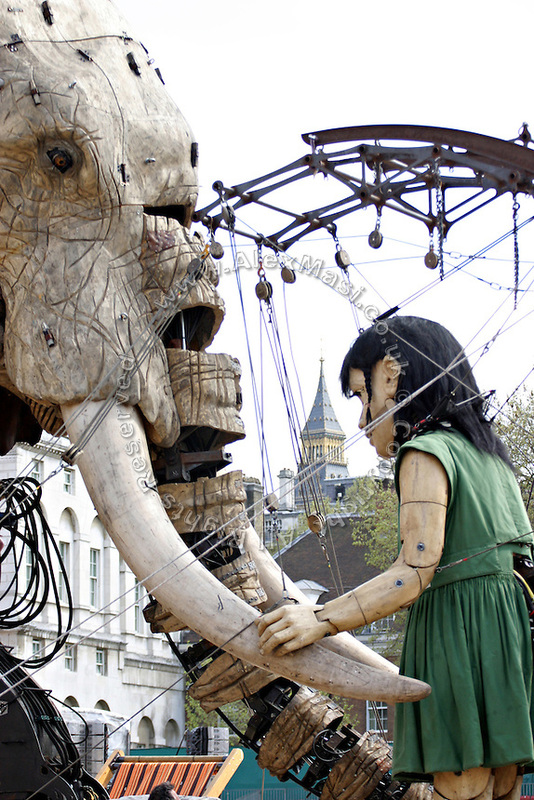 It was created in 2004 by the French theater company Royal de Luxe to commemorate the centenary of Jules Verne’s death and commissioned by two French cities, Amiens and Nantes.. The show takes 3 days to perform, is free, and occurs outside on the streets of the city. Its biggest performance was in London in May of 2006. 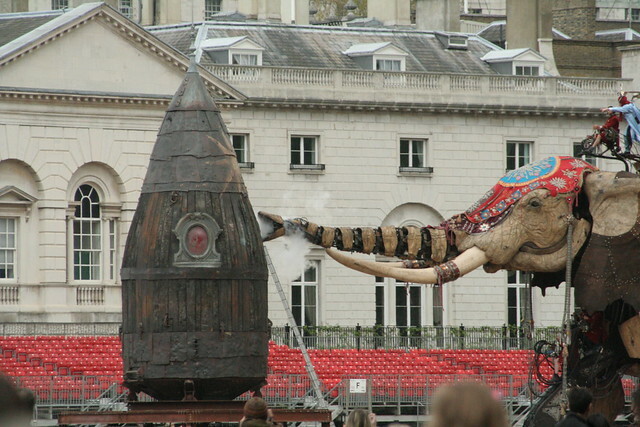 Basically on day 1 a rocket crashes into some town square (in London it was Waterloo Place). The elephant arrives carrying the Sultan to see what’s going on. A huge marionette girl emerges from the rocket. The Sultan has dreamt of her. Girl meets elephant and sultan. 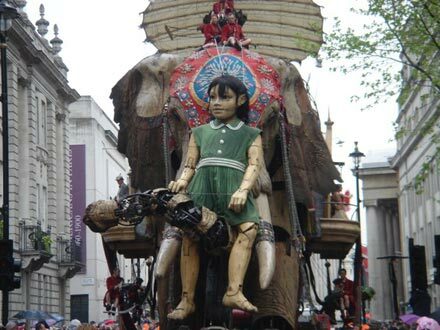 The girl walks around town and the elephant walks around town and on day 2, the girl gets on the elephant and together they tour the city. The girl loves to sew and as they walk about she sews things, like cars to the tarmac. Alas, all batshit insane things must come to an end, and so the girl and elephant bid each other farewell. The girl climbs back into her rocket and time travels away. Obviously the question of Why and WTF would be the first words out fo one’s lips. Do not bother yourself with such questions just accept the awesomeness. Obviously, in a show where dead people being brought back and placed into mechanical doll/mannequins is a major plot point, the look of said Dolls is going to be a big deal. It’s one that i’m clearly curious about, although i will not be the person who comes up with the look. Not my job, not my specialty, so why not leave the conception to someone who dedicates themselves and spends their time focusing on such matters while i’m walking around humming stories in my head like a spaced out nutjob? (or walking though the autumn covered countryside with my 3 year old belting out songs from the Rocky Horror Picture Show at the top of my lungs. See, i do that part well. 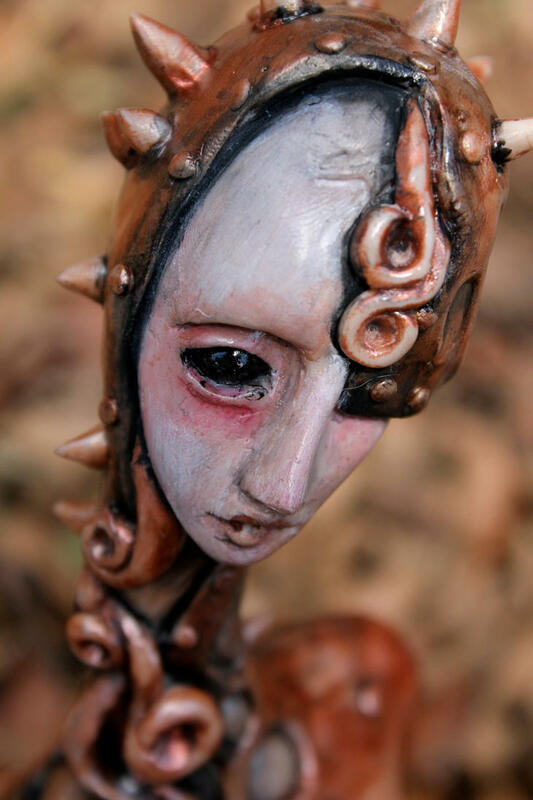 I need someone who looks at trees and thinks “oooooh, that would make an awesome creeppy doll thing!”) Indeed, the look of the Dolls may change with each run of the show, with each designer that comes along. Who knows? However, since the issue is nonetheless of obvious interest to me, i perk up whenever i run across interesting things online. 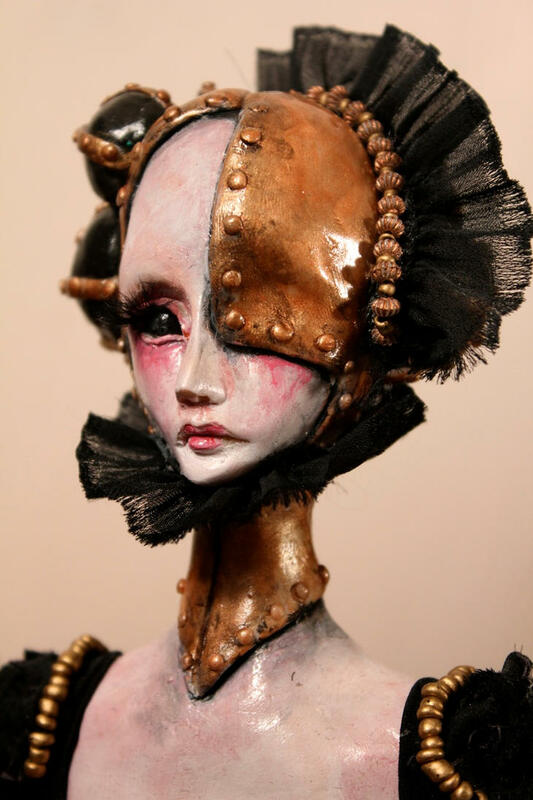 And in this case Interesting Things meaning really creepy and yet utterly awesome dolls. Creepy and awesome at the same time…. i love it.